Too often, especially as we age, the waves of time wash over the sturdy landmarks of our youth like the ocean during high tide; and, when the water recedes, what’s left are merely dull fragments of a once-sharp image. Such is the case with this, the second-ever concert I attended. Much of the night remains a vivid, Technicolor wonder; but much more has been carried away by the receding tide of time. 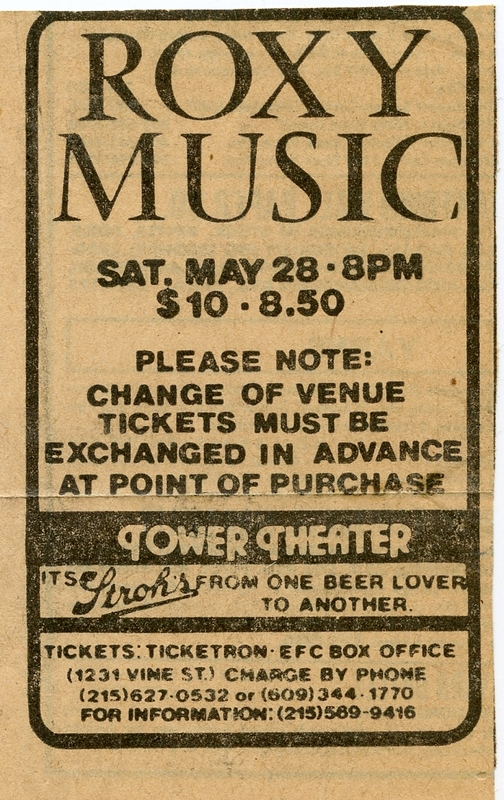 First: As I mentioned in my remembrance of the previous week’s Kinks concert, the show was originally scheduled for the Spectrum in Philadelphia, but was relocated to the Tower Theater in Upper Darby at some point. I don’t know why, but imagine poor ticket sales were to blame. The Spectrum held upwards of 18,000 for concerts; the Tower fit about 3000. An event isn’t downsized that dramatically except to avoid a sea of empty seats. The change in venue made the trip to the show that much more arduous from my neck of the woods. In today’s world, one could hop on the turnpike, exit at Mid-County and take the Blue Route and West Chester Pike. Maybe a 45-minute (to an hour, depending on traffic) trip. But back then? I didn’t drive much, and wasn’t behind the wheel – a friend with his father’s car was – but imagine we took 202 to West Chester Pike, with the 202 portion of the ride likely taking forever. Another friend was with us. I say “likely” because I don’t remember it. What I do recall: Walking into the Tower and being amazed by the decked-out guys and girls milling about. Everyone was dressed to the nines in (stereotypical) New Wave fashion except for the three of us, who wore the typical suburban attire of jeans, button-down shirts and, given that it was a chilly night, light jackets. It was as if we’d stepped into a Duran Duran video, in other words. Our seats were on the balcony, a little less than a third of the way back, where the D-Squared vibe continued unabated. To the show itself: the British band Modern English, who’d caught fire in the U.S. thanks to MTV placing “I Melt With You” into heavy rotation that spring, opened. My only memory of their set is of that song, their last of the night. The moment it began, many on the floor spilled out from their seats and danced in the aisles. One highlight: “Can’t Let Go,” a song from Ferry’s 1978 solo album, The Bride Stripped Bare, which Roxy had just released on the live High Road EP. Another: “My Only Love,” which – given that I’d been playing the High Road EP for much of the month – I knew like the back of my hand. It’s still a thing of genius. Another: “Love Is the Drug,” the band’s lone U.S. hit. Another: their take on Neil Young’s “Like a Hurricane,” which saw a wind machine add to the stormy mood on stage. In its eye: Bryan Ferry, playing it cool; Phil Manzanera, tossing off guitar licks; and Andy MacKay, who wailed away on the sax in lieu of Neil’s swirling guitar solo. The back-up singers provided the proverbial icing on the cake. The night ended with their cover of John Lennon’s classic “Jealous Guy.” It was the perfect cap to a great concert. One other memory: After the show, my friend at the wheel inadvertently ran a red light while trying to figure out where he was supposed to turn. Bubble lights from a police car flashed behind us and, within a few minutes, a bulky cop was leaning inside our car with a flashlight, scanning for any signs of intoxication. What he saw instead: three very sober, and very nervous, suburban kids. He let us go with a warning. April 30th, 1983: I was a high-school senior. All in all, life was grand. 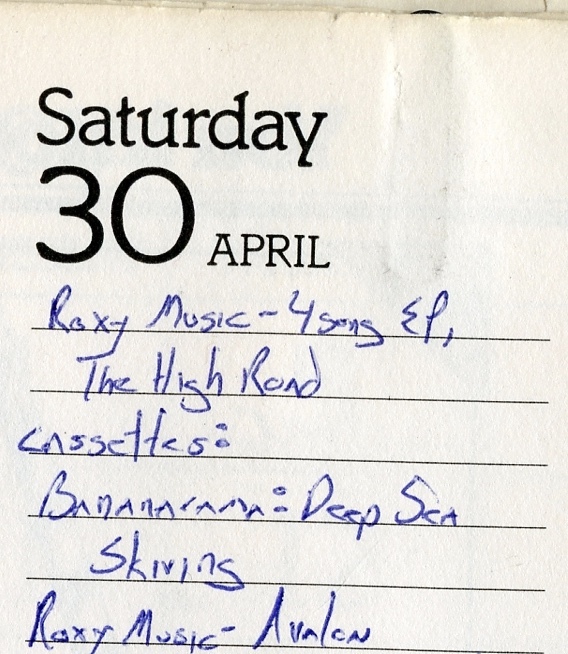 And, as this was a Saturday, that meant me heading to the Hatboro Record Shop, where I browsed for an hour or so before settling on my day’s purchases: Roxy Music’s High Road EP on vinyl and Avalon on cassette; and Bananarama’s Deep Sea Skiving on cassette. 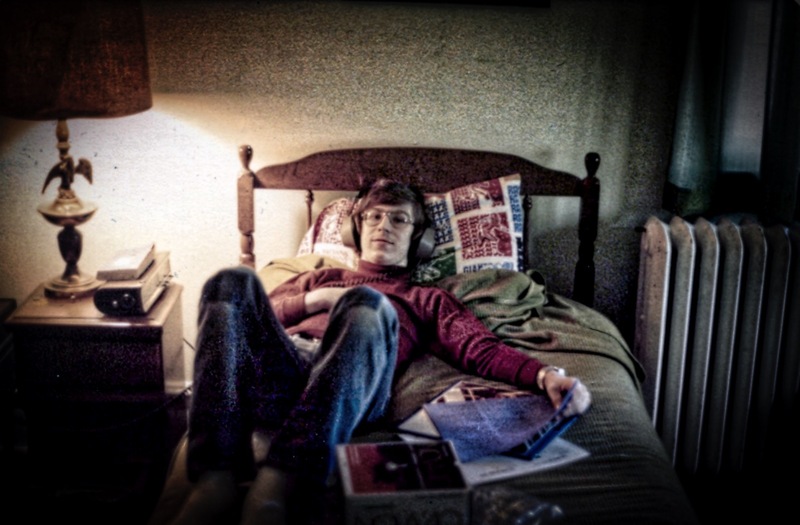 I won’t go in-depth about the month itself; I’ve tread this period of time too much as is. (See here, here and here.) Instead, the reason for this particular post: Roxy Music’s sleek yet powerful rendition of Neil Young’s “Like a Hurricane” from the High Road EP. By the end of the month, in my second-ever concert, I witnessed them perform it in person. It blew me away. Unfortunately, the above version comes from the High Road concert film, which was shot at a different stop on the band’s 1982 tour than the EP. A full-length live album from the tour, Heart Is Still Beating, was eventually released on CD in 1990, but it’s basically the soundtrack to the film with the songs in a different order.